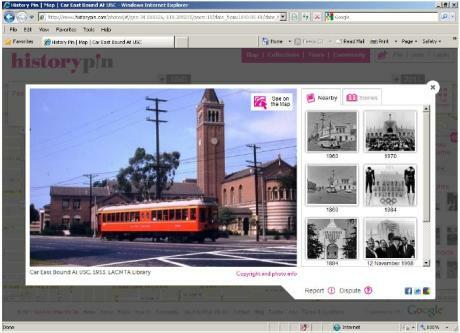 Metro’s Transportation Library & Archive has announced that it is a Global Launch Partner for Historypin. Historypin is an exciting new tool that brings together people, their communities and their shared history through mapping photographs alongside the stories behind them and an interactive timeline. This project has partnered with Google to use their extensive mapping tools and street view imagery to begin building a compelling interactive experience. Readers who follow the Library’s activities may know that its 7,500+ online Flickr photo collection is enormously popular — it has been accessed more than 1.3 million times in less than three years online. Now, Metro’s vast visual resources can be viewed in geographic and chronological context alongside images from other collections to tell the story of Los Angeles — in which transportation history plays a major role. The full story is on the Library’s Primary Resources blog.